Dell has unveiled its latest Alienware laptops, with a refreshed M11X gaming netbook joined by the 18-inch M18X and the M14X. The headliner is the M18X – very much a desktop replacement rather than something you'll be carrying around with you in daily life – which apparently "lays claim to the title of the most powerful 18-inch gaming laptop in the universe". A bold claim indeed. 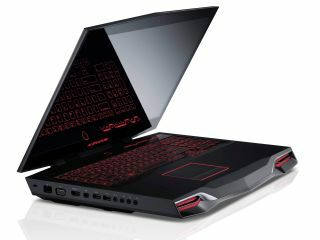 The 18-incher will come with dual-graphics technology and an Intel Core i7 Extreme CPU, factory overclocked to a whopping 4GHz..
"If you're a gamer, you're going to love our new family of laptops, which deliver on the features gamers care most about – uncompromised graphics performance, and lifelike 3D gaming," said Arthur Lewis, general manager of Alienware. "We are committed to delivering the best gaming systems for enthusiasts everywhere and we take great pride in helping them 'pwn', no matter where they are in the world." All of the laptops have HDMI 1.4 and SuperSpeed USB 3.0 ports, the M14X also offers up Core i7 processor options while the M11X has been updated from its already impressive specs to offer up "second-generation Intel Core i processors with Intel Turbo Boost Technology 2.0 and updated graphics featuring the NVIDIA GeForce GT 540M." The prices start at over a grand and work their way up quickly as you pick off the best options. But this is unashamedly high-end gaming kit, so you wouldn't expect bargain basement prices anyway.